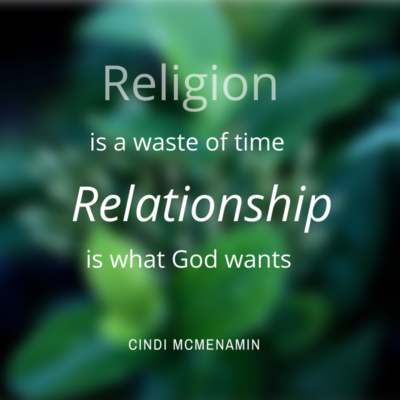 Do you know the God of religion or relationship? I re-discovered something precious in the Word of God this morning. I was reminded, as I was reading in Acts, that I know and serve a God of relationship, not religion. And I am so thankful for that. The god of religion is the one who asks you to do a number of things to prove yourself worthy. The God of Relationship recognized we will never be worthy, but He chose to love us anyway. As I was reading in Acts, I realized, once again, that God knew that none of us could ever be worthy of Him. So, He sent His Son, Jesus, to die in our place — not so that we would have to follow a bunch of rules in our lives. But so that we could know Him (and obey and serve Him) through a relationship. Then Paul goes on to say that this God made from one man all the nations, that they should inhabit the whole earth and “God did this so that they would seek him and perhaps reach out for him and find him, though he is not far from any one of us” (verses 26-27). Religion — all our tireless efforts to win God’s approval — is a waste of time. Relationship is what God wants of you and me. Lord Jesus, occupy my thoughts and heart today with a desire to seek You, reach out to You in obedience and love, and find that You are truly all I have ever needed.I truly want to be able to say, as Paul did, “For in him we live and move and have our being” (Acts 17:28). Do YOU know the God of relationship? And are you giving HIM what He truly desires of you? on Do you know the God of religion or relationship?.